Pop Culture: The key to success? My professors tell me the best way to prepare for interviews, is to read newspapers every day. They highlight the importance of being aware of what’s going on with the economy and current events outside of the 40 Acres, because that’s the world we will be living in. When speaking with adults, being able to apply what we are studying to current events creates more stimulating conversation than talking about assignments and grades. 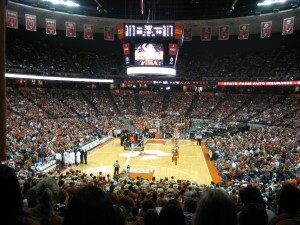 What better place to follow sports than at our own Frank Erwin Center cheering on the mens Longhorn B\basketball team! After this I thought I had what I needed for recruiting down: news and sports. In addition, when I think back to my prior experiences with recruiters, it is true that I have discussed sports and current events many times, but many conversations centered on pop culture like movies, music and TV shows. Talking about these things has the same effect as sports, they help establish relationships. Talking about these things helps me to determine if I could work with someone for over 8 hours a day. If we like the same movies and TV shows, we most likely have very similar senses of humor and personalities. This revelation helps me in two ways. First, it will help me prepare for recruiting and building relationships. Second, it will help me convince my parents it is essential for me to catch up on all my TV shows over break!